Save On Medical has added over 40 Los Angeles radiology providers to their network of physicians offering price transparency and online scheduling. The average price of an MRI in L.A. is $1,009. On SaveOnMedical.com the same MRI costs $494 (51% savings). Save On Medical is now offering pricing and online scheduling capabilities for over 40 radiology providers in Los Angeles, California. With 17% of the city’s residents uninsured, patients are in need of affordable care options and can now compare their choices. Patients searching for the price of an MRI on Save On Medical can see that the average price in Los Angeles is $1,009, while they can save about 51% by scheduling their appointment through the website. 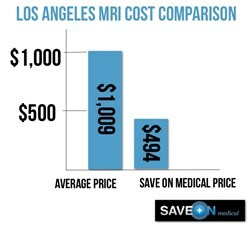 The average cost of an MRI on SaveOnMedical.com in Los Angeles is $494. All too often, uninsured patients go without the care and screenings they need due to high costs, Save On Medical is changing that. Save On Medical’s partnership with Relevant Health Care Cost Containment has enabled the website to grow their physician network in Los Angeles and in a number of other California markets. Kaiser Health (2011 data) notes that California has the 4th highest uninsured population in the country. With this in mind, Save On Medical made it their mission to improve price and quality transparency for those patients shopping around for care. Save On Medical is a website for patients shopping for and scheduling affordable radiology procedures. Patients can compare physicians based on price, quality and convenience. Save On Medical allows for price and quality transparency in the health care market, helping patients make smart consumer-driven healthcare decisions. Just like travel websites like Hotels.com and Travelocity, Save On Medical provides patients with a list of options, and the ability to pay for medical procedures at a fraction of the price.